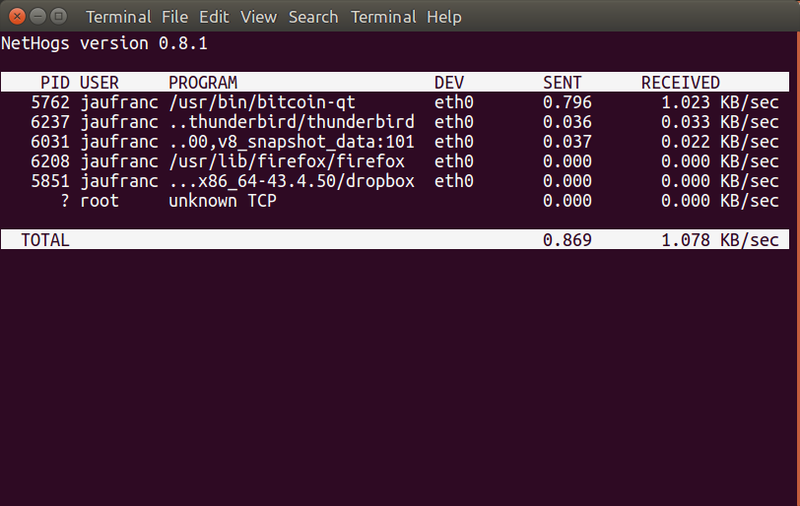 Sent 5815 bytes, received 6972 bytes. But if you get much more traffic than that, you may want to investigate if another package may transfer data when it detects the connection is up. To analyze traffic, tcpdump and Wireshark are good options, especially if you want to look into the packets data, however such tools do not tell you which process is sending or receiving the data. So I searched whether I could find a program that would do just that, and a thread on Ask Ubuntu discussing how to display network traffic in the terminal, mentions some interesting utilities like bmon, iftop, tcptrack, etc… which all show info about the connections, but the utility that does exactly what I I want is called nethogs. Installing it in Ubuntu/Debian is very easy. device [device [device …]]] -V : prints version. –h : prints this help. –b : bughunt mode – implies tracemode. –d : delay for update refresh rate in seconds. default is 1. –v : view mode (0 = KB/s, 1 = total KB, 2 = total B, 3 = total MB). default is 0. –c : number of updates. default is 0 (unlimited). –p : sniff in promiscious mode (not recommended). –s : sort output by sent column. –a : monitor all devices, even loopback/stopped ones.